Authored by Marco Alamia (Macro) on Nov 27 2018, 6:04 AM. "Love" token, awarded by kioku. The issue I am trying to solve happens when baking a texture along a hard edge. I have attached an explanation with pictures and a blend file. Thanks for the patch, this looks really good! I'm not exactly a baking expert, but the functionality looks reasonable to me. I've got a few notes inline, but most of it is just nitpicking, no real concerns (except for the pointer cast). General note on the code style (more nitpicking, sorry): As far as I can see this file uses spaces after if/for and opening braces on the same line with a space before them, so new code should stick to that as well. Also, the existing code unfortunately tends to skip braces around single statements, but for new code that should be avoided. Please use regular comments instead of pseudocode that looks like valid C to explain the algorithm. When you're calling vertex_to_sort_compare here, the pointer to the float array sorted_positions is cast to VertexToSort* and it only works because you only access the first element which happens to be a float array as well. Just calling position_compare would be a lot cleaner. We're using C99 now, so you can move those declarations to where they're actually needed (e.g. normal to line 645). Loop indices make sense here though. The existing code is mostly still written for C89. You can shorten this code a lot by using copy_v3_v3 etc. and doing a loop over the three vertices per tri. Those two arrays are only references once each, I don't think the additional shortcut variable is really needed. I think you should be able to get rid of this pointer by always passing &average_normal_data and checking average_normal_data->count > 0 in calc_point_from_barycentric_extrusion. Thanks Lukas for taking the time to code review my patch. I have applied all the changes. The compare one was a legit bug, that function was operating on vertices rather then just position originally and I failed to change the compare function when I moved to positions. Thanks for catching that! Marco Alamia (Macro) marked 7 inline comments as done. No changes from the previous revision - I have a feeling that I did something wrong when submitting the previous time since I have flagged some of the review as "Done" but the tool insist they are "Unsubmitted". I am not clear if it's my fault but it should be harmless to resubmit the same review. Is this different than just setting smooth normals on the low poly base mesh? Is the way the averaging works better in some way? Is it a matter of usability so user don't need to modify the low poly meshes? To me it seems odd that we are using binary search to figure out which face corners share a vertex, when that information is already defined in the mesh. Or is this for modifiers like edge split that split the mesh, where that connectivity information is lost? This should have an explanation of why this is needed. Do you think this should be enabled by default? Unless it is actually trying to support edge split, is there any reason this can't just use the actual Mesh vertex normals? Marco Alamia (Macro) marked 2 inline comments as done. Thank you for your time and for the review. Yes, it is for modifiers like edge splits or the autosmooth feature. Once the normals are split I don't think the mesh has a way to recover the "averaged version" anymore. If there is a way to do it that I am not aware of I wouldn't mind switching to that; I ended up with that binary search because I had to create the avg normal data from the split normals. It is exactly for edge splits and autosmooth. You are correct that if you were to use smooth normals you would get exactly the same result as far as the projection is concerned; the issue though is that the TBN would also be using that normal, which means that the resulting normal map would not be "flat" on flat regions, making it impossible to manually paint it for cases where you might want to add in details (such as screws or grooves or whatnot). This feature doesn't change the geometrical normals so the TBN remains flat, the normal map is flat, but the projection has used a "bent" normal fixing the seam that would appeared using the geometrical flat normal. Are you sure you want an explanation of why is needed there? All other properties seem to have an explanation of what it does rather than why. If you feel strongly about it I can try to put an explanation of why but it might become a bit verbose. Let me know. I just checked Painter, their help reads: "Compute rays directions based on averaged normals"
Good question, I don't know. It's enabled by default in Painter, but I am not 100% sure what's best. Don't mix those two together, they are completely different. Edge split actually splits the mesh completely, while autosmooth only splits the normals. Thus with autosmooth there are still shared vertices and averaged vertex normals. I see, so I could technically get rid of the extra calculation for avg normals in the autosmooth case but I will still need it for edge splits? Is it worth treating them differently though? Is it easier to let them both flow through the same code path? The Edge Split modifier is from before Autosmooth worked in the viewport and supported sharp edges and custom normal editing. There are not a lot of people using the modifier anymore, as far as I know. It is mostly there for legacy reasons. Personally I think it would be fine if this only worked with Autosmooth, with simplified code. The explanation could be as short as: "Use smooth averaged normals for projection, to avoid continuity artifacts around sharp edges." My new Target Normal Projection mode in the shrinkwrap modifier (basically intended to address a vaguely similar mapping continuity problem to this) simply uses the vertex normals and thus won't be smooth with edge split either. Are you sure about the averaged normals being there when using autosmooth? 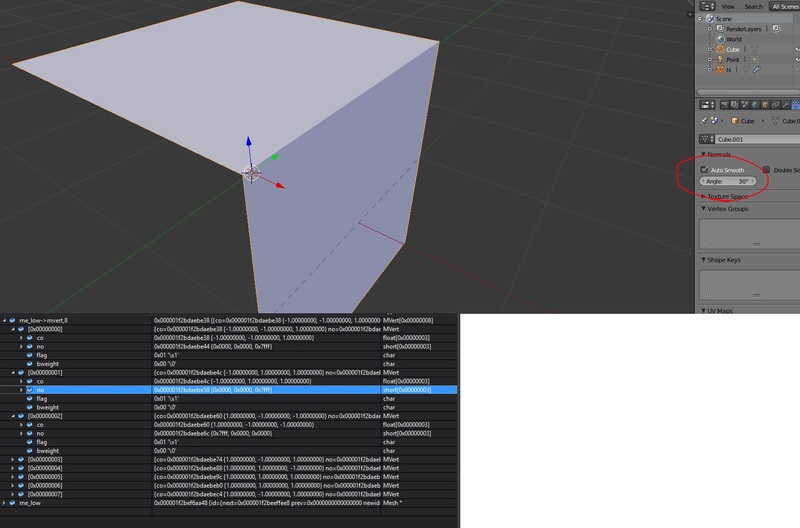 I have created a simple mesh that I have autosmoothed but the mesh (struct Mesh in code) doesn't seem to have them. Am I looking at the wrong data structure? Is there another way to access per vertex information that has averaged normals? I have attached an image to detail what the mesh looks like and the Mesh vertex data that goes with it. Is the sort the main concern? While I was searching for the averaged normals that Alexander mentioned I realized that the bake mechanism is actually creating the triangles by reading the Mesh data. I could change the triangle creation code to store the average normal so that it would be readily accessible during baking. The only issue is that I would probably still need to sort and search if the average normals aren't stored somewhere already. Dalai Felinto (dfelinto) added a subscriber: Jan Vetulani (jasiuek). will this be there for the final release of 2.8? Not being able to bake normals from HP to LP while the LP has edited normals kinda makes baking for a lot of gamedev work in 2.8 unusable. I apologize but I have lost track of what I am supposed to do to continue with the review process. I have applied the various changes although I stopped at the last wave as the discussion seemed to have died out. Unfortunately I ended up neglecting to follow up after a few weeks and left this in a limbo. It would be nice to wrap it and finalize the commit or alternatively close the change completely so it stops hanging in this half done state. Please advice me on what is the best way to move forward.